It’s the time of year when we all make a special effort to count our blessings and acknowledge the many good things in our lives. Here at Writer’s Relief, we are thankful for our friends, our families—and, of course, writers and the gift of their words! 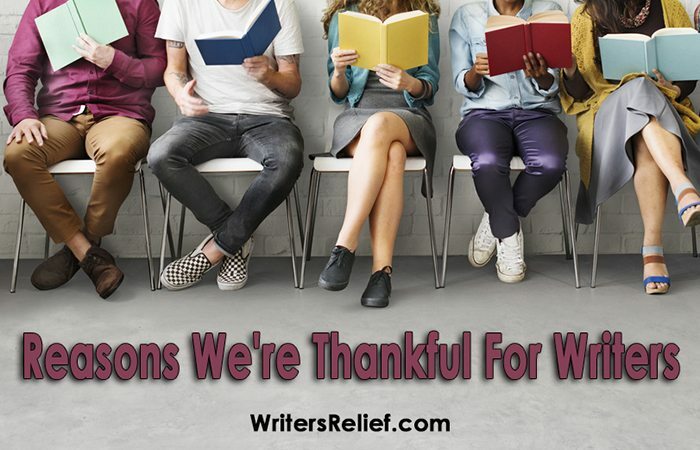 We asked a few people to tell us the reasons why they are thankful for books and writers. What can you add to the list below? Tell us in the comment section. • I’m thankful for writers creating books for me to read during my leisure time! • I’m thankful to writers for inspiring me through the good and the bad. • Writers enrich our lives and expand our horizons in countless and often unexpected ways. I can’t imagine a world without writers! • I’m thankful for writers and books because it’s so enjoyable to get lost in a writer’s imagination of characters, scenes, and worlds they have created. • I’m thankful for sci-fi writers because they can boldly explore the inevitability of change and study it to its extremes. We often see the world differently after such an experience, and this can give us a sense of wonder and awe due to our own perspectives being augmented irreversibly by these new ideas. • I’m thankful for writers and their ability to reflect real life on the page, bringing us to fantasy worlds we want to be in, and taking us on emotional journeys that have the potential to be life changing. • I’m thankful for writers who create new lives and worlds that I can explore. • I’m thankful to writers because they give us so much to think about! Reputable journalists are especially important to us these days because we get important news from so many sources. • I am thankful to writers for providing me with a method of transcending time if only for a short interval. Question: Why are YOU thankful for writers? Tell us in the comments!